ALIS Induction Power Hubs are central to our ALIS platform and are essential when installing ALIS Barn Lamps, ALIS Tube Lamps and ALIS Nest Lamps. Induction technology is becoming increasingly commonplace in the home, powering everything from electric toothbrushes, kitchen hobs and phone chargers. 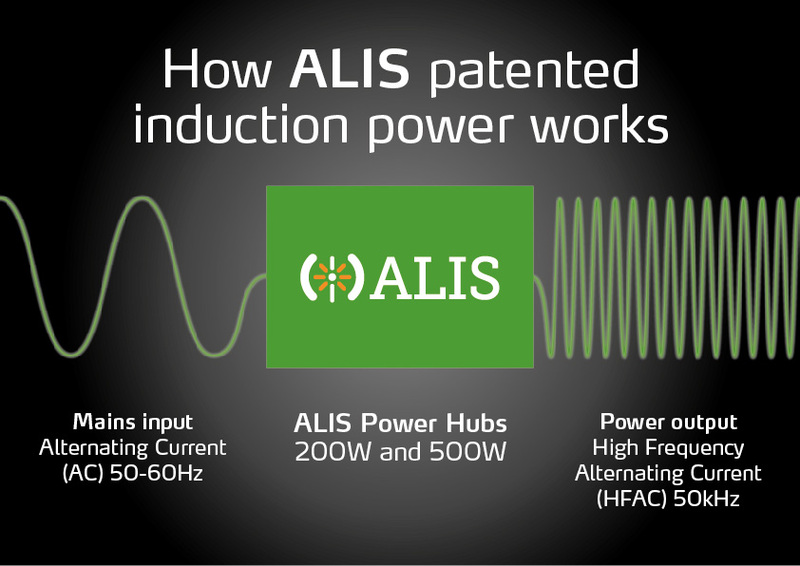 Basically, mains input Alternating Current (AC) 50-60Hz is converted by ALIS 200W and 500W Power Hubs into High-Frequency Alternating Current (HFAC) 50kHz which in turn is sent down the proprietary ALIS Bus cable to power the ALIS lamps and sensors. Can reduce installation time and lamp replacement takes minutes. Efficient energy consumption with 0.95 Power Factor. Read more. Keeps power 'front of house' for safety and improved bio-security. ALIS lamps clip on to the ALIS Bus cable (see video opposite). To see for yourself, how our ALIS platform makes livestock farming easier, smarter and greener call +44 (0)131 650 8850 or complete the form above for a brief presentation.